ALU, Jabukovac 10 is the name of the group exhibition of students from Zagreb’s Academy of Fine Arts from the class of Miroslav Šutej. Šutej is one of the few professors that turned the act of public exhibiting in one of the galleries of contemporary art into a part of the pedagogical program. Therefore this generation also got the chance to publicly present the results of their, at this moment, still unfinished education. 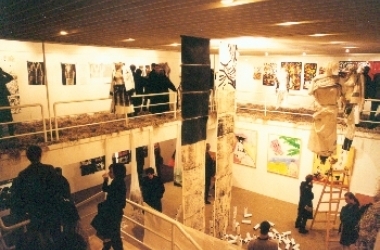 The students that participated in the exhibition: Jelena Bračun, Petra Brnardić, Maja Cipek, Maja Curman, Josipa Čačić, Danijela Gerard Phillip, Izabela Hren, Gordan Krabogdan, Natali Kasap, Ksenija Kordić, Goran Kujundžić, Miron Milić, Ivan Domagoj Vuco and Silvio Vujičić.